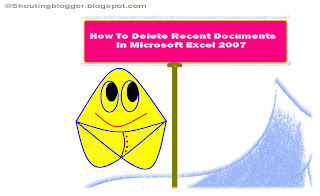 Step 1 : Open Microsoft Excel 2007 . For Classic Start Menu : Go to start , Programs , Microsoft Office and then Microsoft Excel 2007 . For Start Menu : Go to Start , All programs ,Microsoft Office , Microsoft Excel 2007 . Step 2 : Click On Office button . Step 3 : Under Office button window , Now click on Excel options . Step 4 : Under Excel options , Click on Advanced . Step 5 : Under Excel options ,Advanced Scroll down to Display labels . Watch on Youtube " How Do i Delete Recent Documents In Microsoft Excel 2007 "